VMware’s Network Virtualization Platform, NSX, is an immensely powerful technology that can transform a datacenter’s infrastructure and streamline network service delivery across the enterprise. NSX’s scope, scale, and capability will easily impress techies, CCIE’s, and IT stakeholders alike. NSX changes the topology of a traditional hardware-bound network by eliminating the dependency on all that “intelligence” baked into proprietary hardware. Instead, the logic and associated services are delivered through a software control plane. Separating the control and data planes effectively reduces the physical network to a glorified IP packet forwarder. By now you’ve probably heard all the hype around the 5.1 releases of VMware’s vSphere and vCloud platforms – and the vCloud 5.1 Suite, which bundles the latest versions of several VMware key IaaS-focused technologies and delivers a comprehensive cloud solution. The suite comes in 3 flavors – Standard, Advanced, and Enterprise. If you’re an existing (active) customer of any of these products, there’s an upgrade and/or entitlement path to the suite for you – and it’s highly recommended that you take advantage of it. Or, at the very least, you can upgrade your individual products to 5.1 as you ponder the suite. Whether or not you choose to upgrade and take advantage of the latest and greatest features is up to you. But if you’re looking for increased scale, performance, efficiency, and capability while taking advantage of end-to-end advancements in VMware’s leading cloud technologies, then I would place upgrade at the top of your to-do list. (some of my peers suggest I’m drinking the Kool-Aid via fire hose….really?). Learn more about the suite here: http://www.vmware.com/products/datacenter-virtualization/vcloud-suite/overview.html. 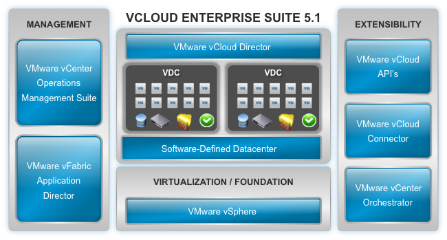 The attached guide will walk you through, in detail, the upgrade steps and procedures for moving to vCloud Suite 5.1. I spend a lot of time discussing VMware’s vCloud solution stack to many different customers, each with varying objectives when it comes to their cloud journey. The majority of them fall under two groups – Group A) those who know what they want and where to get it and Group B) those who think they know what they want and have been shopping for the “right” solution since before cloud hit the mainstream – one “cloud bake-off” after another while changing requirements in real-time. Can you guess which ones meet their objectives first? Hint: it’s the same group that delivers IaaS to their enterprise and/or customers using proven technologies and trusted relationships in the time it takes the other to host a bake-off. Are you ready for Cloud? Strategy – Aligning business needs with IT capability. Process – Streamlining and automating processes to achieve business agility. Architecture – Establishing an enterprise architecture for this new IT infrastructure. Technology – Designing and deploying your technology infrastructure from virtualization to cloud. People and Governance – Creating the roles and skills necessary to ensure company-wide adoption, and the accountability framework and policies for stakeholder collaboration.